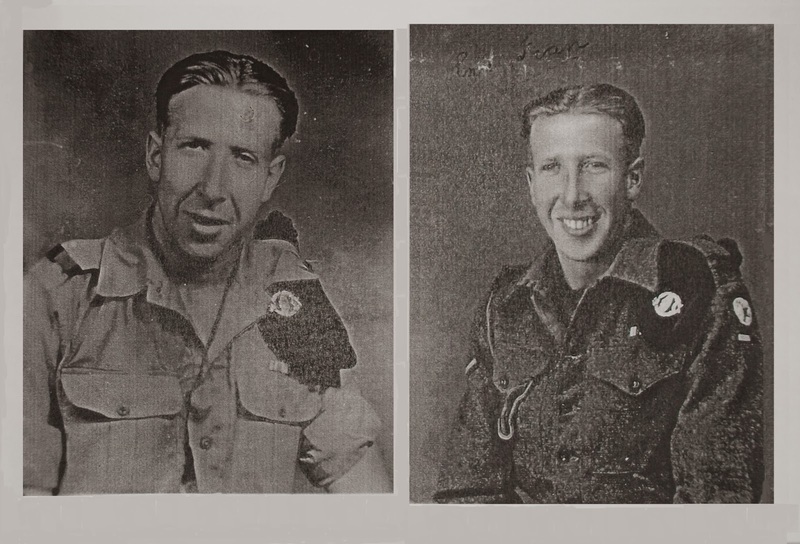 WW2 - The Second World War: Ivan F. Renwick, Border Regiment and R.T.R. Corporal Ivan Frank Renwick (1919 - 2013) from the Cleator Moor area of Cumbria served in the Army during the Second World War. He enlisted firstly to the Border Regiment on 15 November 1939. His service number was 3601475. Prior to enlistment, Ivan was a farm labourer. Photograph No. 1 (above) of Ivan was taken on 10 April 1940. He is wearing the cap badge of the Border Regiment. Shortly afterwards, Ivan crossed the Channel to France as part of the British Expeditionary Force (B.E.F.). To begin with, things were relatively quiet - this was the time that became known as the 'Phoney War'. It was not to last. The German assault on Belgium, the Netherlands and France began on 10 May 1940. By the end of May Ivan, his Border Regiment comrades and the remnants of the B.E.F. found themselves at Dunkirk trying to hold back the German advance while the Allied troops were being evacuated. Ivan Renwick was one of those who was lucky enough to evacuate from Dunkirk and make it back to Britain. Ivan Renwick with the 40 R.T.R. Ivan went on to serve with 40th Royal Tank Regiment (40 R.T.R.). Photograph No. 2 (above) shows Ivan while serving with 40 R.T.R. 40 R.T.R. was an armoured regiment of the British Army from 1938, originally formed by conversion of the 7th Battalion The King's (Liverpool) Regiment, which was previously a Territorial Army infantry battalion. The Royal Tank Regiment also formed part of the Royal Armoured Corps. During the war it saw action in the Middle East, North Africa, Italy and Greece. As can be seen from Photograph No. 3 (above) on 4 June 1944 Ivan was with his crew mates in Egypt. Ivan can be seen second on the right. On 2 June 1944, 40 R.T.R. were allowed some rest and recreation after a long period of almost continuous action. This photograph was taken in front of the Great Sphinx of Giza and the Pyramid of Khafre. At the end of June 1944, 40 R.T.R. began the move to Camp 521 near Gaza (Palestine) for training and re-fitting before returning to Egypt at the middle of August including some infantry refresher training. On 13 October 1944 40 R.T.R. embarked for Greece, where a civil war broke out in December of that year. Ivan remained with 40 R.T.R. until he was demobbed in mid-1946. Around the same time, 40 R.T.R. was placed in 'suspended animation' (although it became an Armoured Regiment of the Territorial Army the following year). "Testimonial: He has served for a long period of active service in total, where his skill and intelligence resulted in his promotion to Corporal. He is reserved by nature but possessed of a keen, shrewd outlook. He is hoping to enter employment as a game-keeper. His ability and diversity are strong recommendations for Ivan and he can be depended on to put heart and soul into any task given him." 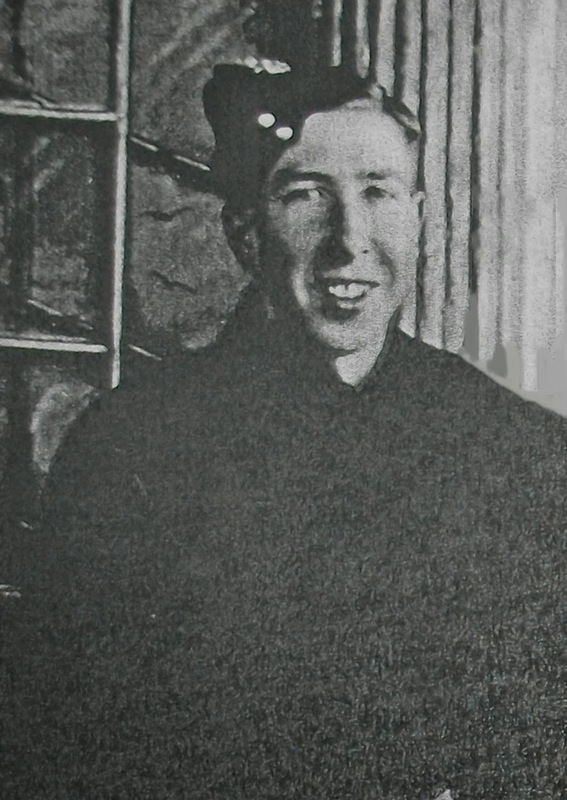 In the post-war years, Ivan Renwick was a member of both the Royal Tank Regiment Association (Merseyside Branch) and the Dunkirk Veterans Association (West Cumbria Branch). 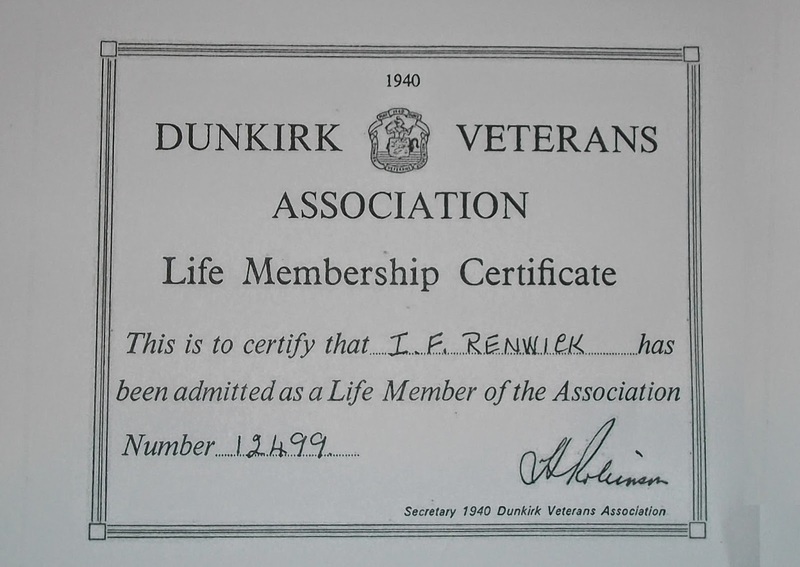 A copy of his Dunkirk Veterans Association membership certificate can be seen above [Photograph No. 4]. The names of the West Cumbria Branch of the Dunkirk Veterans Association, including Ivan's, are commemorated in a memorial in the custody of the Parish of Whitehaven at St Nicholas' Chapel, Whitehaven. Ivan Renwick passed away at the age of 94 on Thursday 7 November 2013, a few days before Remembrance Sunday. His funeral service took place at Cleator Moor Methodist Church on Friday 15 November 2013: his last salute. This article is dedicated to memory of Mr Ivan Frank Renwick (1919 - 2013). "I was called up for National Service in November 1939 and posted to "D Company", 5th Border Regiment. I went to France and Belgium on active service in early 1940 building an extension to the Maginot Line. On the German breakthrough we rushed up to into Belgium and then fought a rearguard action back to Dunkirk. In 1941 the Brigade trained on armour and I became a gunner / wireless operator. 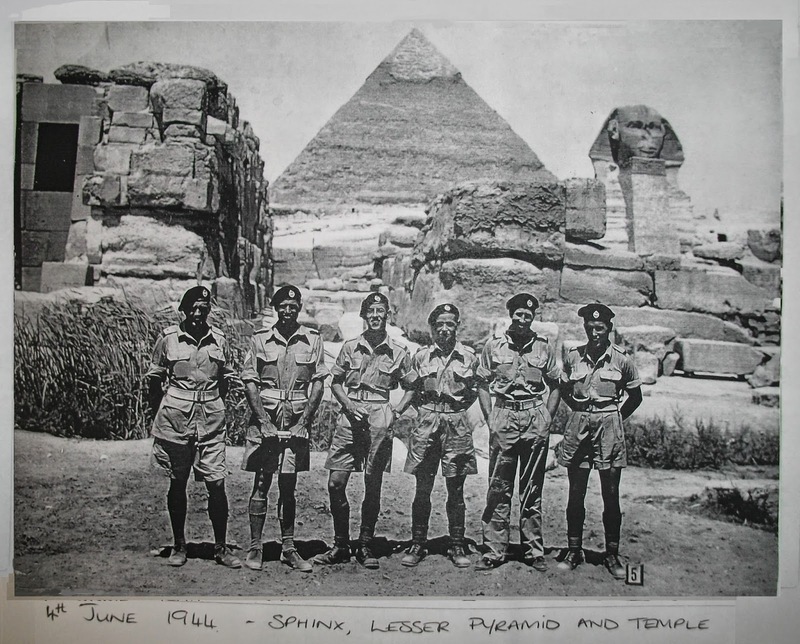 In early 1942 we went to the Middle East, Egypt, for the Delta defence. I joined "C Squadron", 40th R.T.R. prior to El Alamein with Valentine tanks - still as a gunner / wireless operator. I served with the 40th throughout the Desert campaign to Tunis. We were issued with Sherman tanks for the Salerno landing and served as a gunner (75 m.m. guns). We went up Italy to Monte Cassino and then went back to Egypt and Palestine during the unrest and then to Greece during the Civil War. I was a tank gunner then a tank commander. I was demobbed in Greece in 1946." (Thanks to John Pryde of Cleator Moor Methodist Church for kindly supplying a copy of Ivan's written testimony).